Among the many atomic/molecular assembling techniques used to develop artificial materials, molecular layer deposition (MLD) continues to receive special attention as the next-generation growth technique for organic thin-film materials used in photonics and electronics. 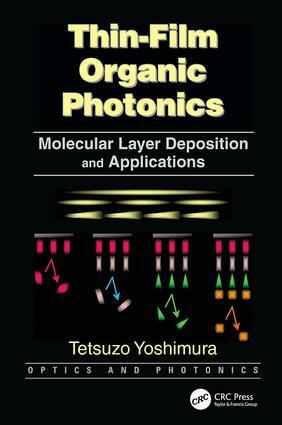 Thin-Film Organic Photonics: Molecular Layer Deposition and Applications describes how photonic/electronic properties of thin films can be improved through MLD, which enables precise control of atomic and molecular arrangements to construct a wire network that achieves "three-dimensional growth". MLD facilitates dot-by-dot—or molecule-by-molecule—growth of polymer and molecular wires, and that enhanced level of control creates numerous application possibilities. With its clear and concise presentation, this book demonstrates exactly how MLD enables electron wavefunction control, thereby improving material performance and generating new photonic/electronic phenomena.